I've always loved this image - think how much fun she is to use for birthdays or any other reason to celebrate. 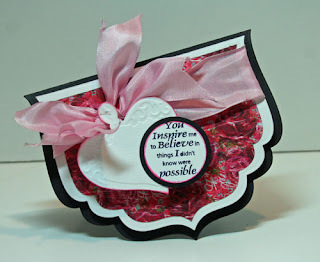 It was very quick and easy to create this card just by using Black Mix'd Media Ink, Embossing Powder and some Siren Smooch. 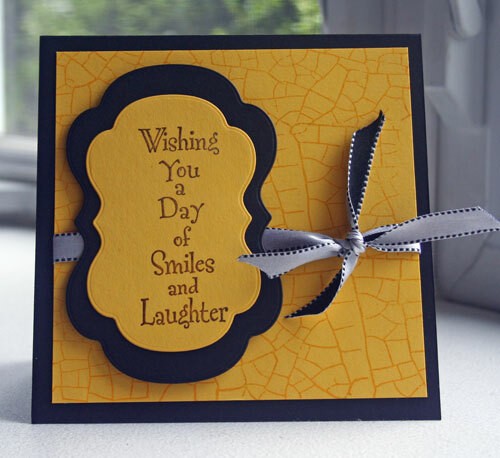 The newest challenge at JustRite is to create a shaped card. 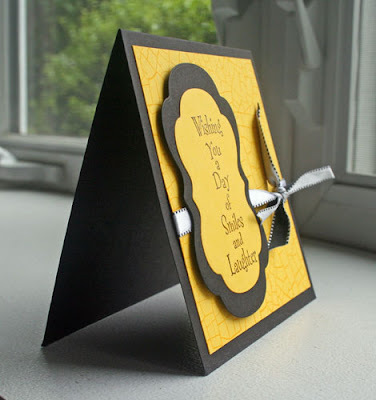 Using Spellbinders Grand Calibre dies, I created my card base from black cardstock. Using my Scor-Pal, I was able to create the perfect crease line and then simply folded the die cut cardstock in half. 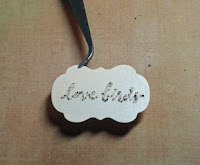 Using the next size die, I cut the white layer. Using the next size die , I created the pattern paper layer. 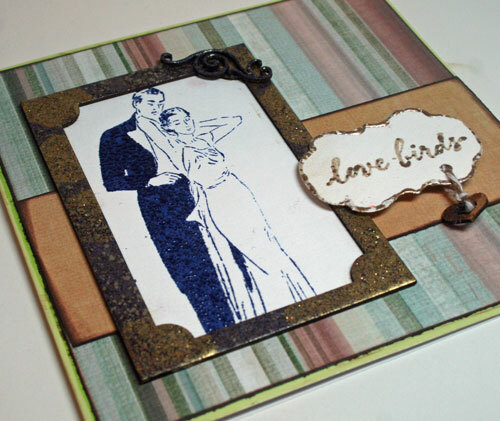 I used a Cuttlebug Embossing Folder to add a little more depth to the pattern paper. I adhered the smaller layers together using Scor-Tape and wrapped a ribbon around it, tying a bow in the left corner. I die cut the Spellbinder heart and attached it to the ribbon with a paper tagger. 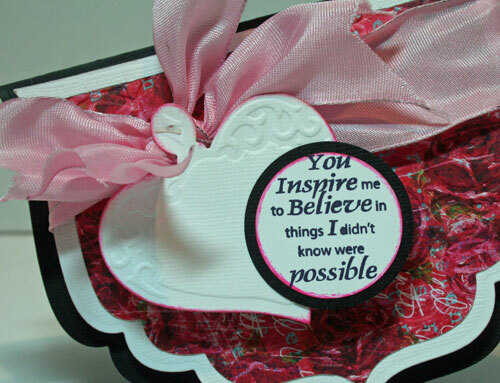 The sentiment was stamped in black ink on white cardstock, edged with pink ink and matted on a black circle then adhered to the heart. 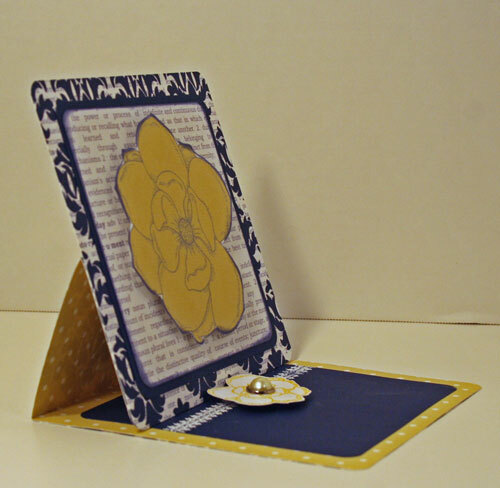 Top view - I added foam adhesives so the layers would stand out from the base of the card. I added a white layer inside the card. 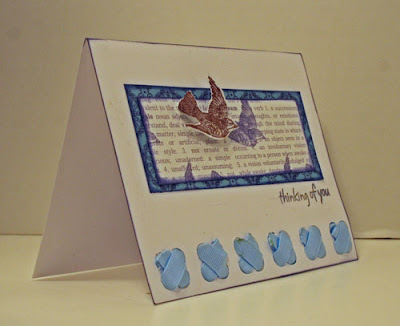 Close up of the sentiment using an "older" JustRite Original set - You are My Anchor, which I layered on top of a Spellbinders die cut heart. Here are some more projects I created with my Fotobella kit this month. This wondrous package contained all things Teresa Collins and is called Everyday Moments. This is such a beautiful collection. 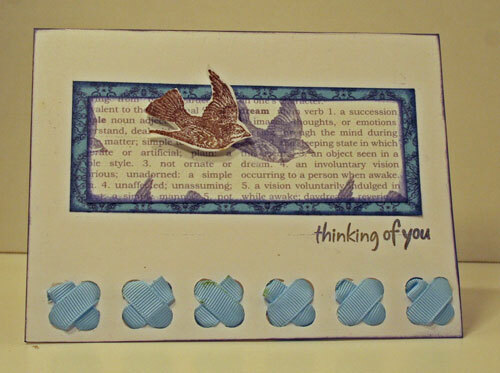 These stamps are beautiful and were perfect to create the background of my card. O then stamped several more and cut them out. I actually cut part of the packaging to use as the background paper for this card. This easel card uses stamps to hold the easel in place. The large flower was cut from the pattern paper. In addition to using this kit, I also incorporated WERMemories Sew Ribbon and Flower Sencil along the edge of my card. What a fun tool and technique. 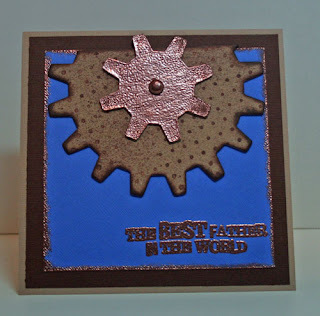 Getting ready for Father's Day and having some fun creating with Basically Bare embellies and Clearsnap Inks - what a wonderful combination! 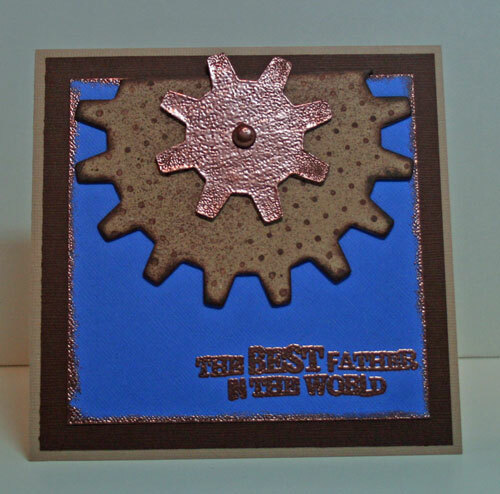 For this Father's Day card, I used the Bare Basic Gears - perfect for a guy card don't you think? I inked the largest gear with the Simple Dots Rollagraph Wheel and Leather Mix'd Media Inx. I then just inked the smaller gear with Leather Mix'd Media Inx and embossed with Leather Mix'd Media Embossing Powder. I love the look. I inked the edge of the blue cardstock with Leather Inx and then embossed with Leather Embossing Powder and heat set for a nice metallic-like finish around the card. 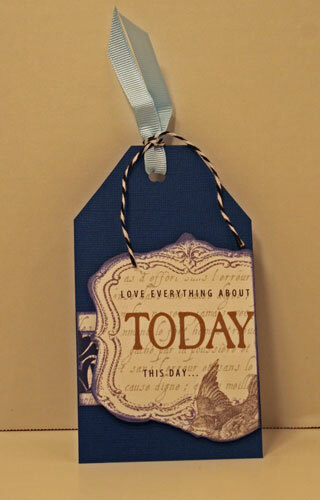 The sentiment was also stamped and embossed with Leather Mix'd Media. 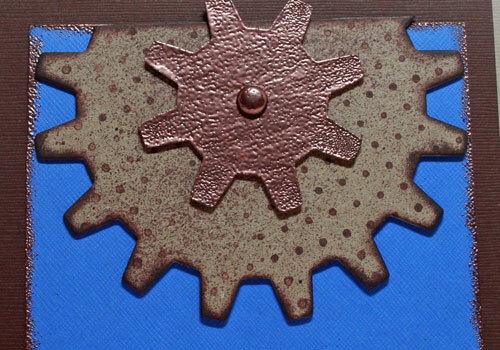 A close up of the gears. As the largest was a little too big for my card, I simply cut off one edge and inked it. I received an amazing kit this month from Fotobella.com. 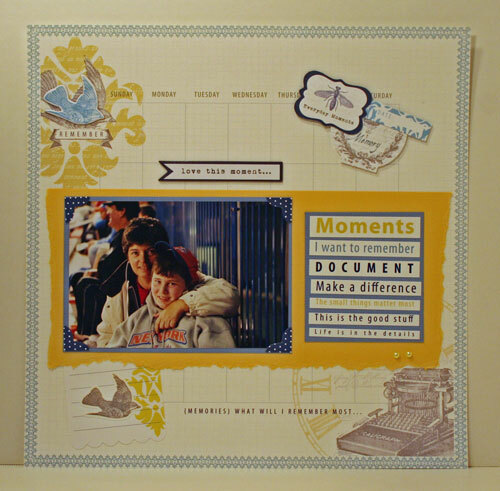 called Everyday Moments by Teresa Collins . 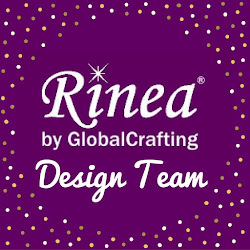 This wonderful kit contains 17 pieces including beautiful double sided heavy pattern paper, awesome stickers, beautiful layered Stickers, stamps, some chipboard elements, beautiful rhinestones, brads, buttons, and trinkets. 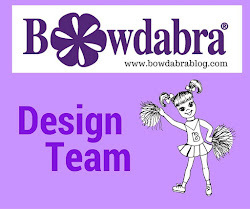 Check out this Fotobella post for all the details of my projects. I came across this awesome Loralei stamp and knew she'd be perfect to color with Copic Markers. I first stamped the image with Black Memento Ink because it's the perfect ink to use with Copic Markers. It dries fast and doesn't interact with the Copic Markers. I began by coloring her body with E02, E01 and E000. For the age spots I used E57. Her hair was colored with E29, E24 and E15 and her lips with R59. Her pants were colored with YR16, YR14 and YR12. The earrings are YR16. The hat uses a combindation of E15, YR14, G99, G24 and YR12. For her eyes I used G24 with V12 for the eyeshadow. Her shirt and shoes were colored with B93, B91 and B95. The cake was colored with E15, YR14, YR12 and YR000. The candles were colors with R33. YR14 amd YR16. Her cheeks and glasses were colored with R83, G24, C1. Once I finished coloring her, I cut her out and inked the edges with C1. 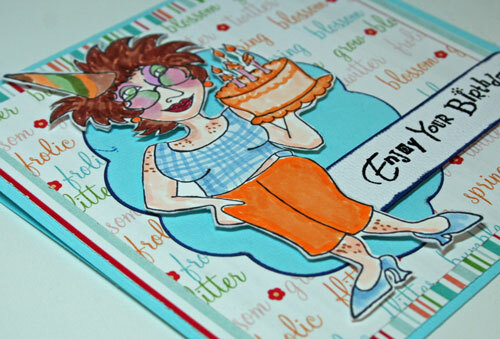 To create the card, I cut cardstock into a 5 1/2" square, then cut my striped pattern paper into a 5 1/4" square. The top layer paper was cut into a 5" square. I used the largest Spellbinders Scalloped Oval Die as the mat for my image, inking the edges with C1. 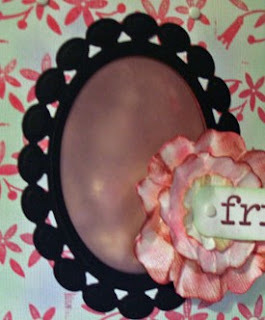 The image was then added to the oval with foam adhesives. 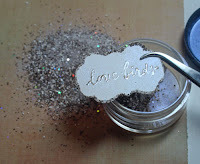 I stamped the sentiment in black ink and added black embossing powder. Cutting it, I inked the edges and placed it slightly behind the image. Today's post at the Papertemptress. 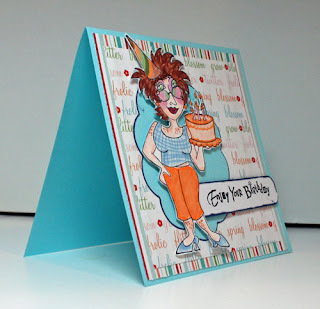 Papertemptress' papers are just amazing for creating the foundation for cards. I used Eclipse Black for the card base, cutting it to 5 1/2" x 11" and then scoring at the 5 1/2" point to create a square card. Using Lemondrop I cut it 5 1/8" x 5 1/8" to fit the card front, then used a Crackle Background Rollagraph Wheel from Clearsnap with Stephanie Barnard Banana Dye Ink to create the pattern on top. I was able to stamp my sentiment in Clearsnap's Espresso Pigment Ink and then emboss with Clear Embossing Powder. 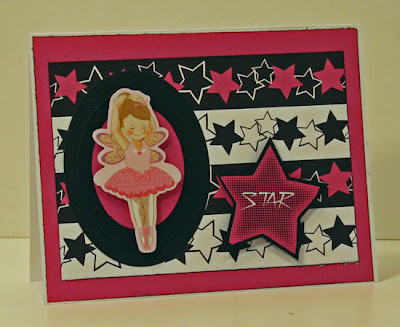 I then die cut my shapes using Spellbinders dies and the Grand Calibre Machine. 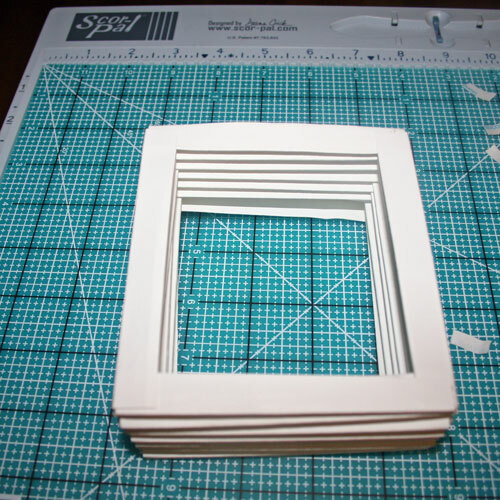 Again, no problems, everything cut easily and perfectly. I tied some ribbon from the Papertemptress around the card before adhering my sentiment with foam adhesives. If you want to make someone go WOW! 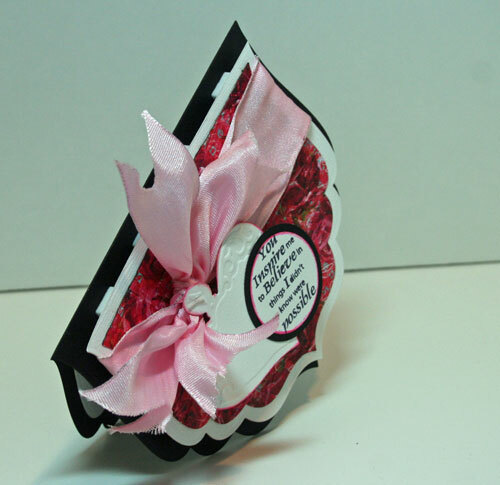 after receving a package from you, try creating this Book Box! It is a little time consuming, but the WOW factor is amazing! Cut white cardstock 5 1/2" x 10 1/2". Using Scor-Pal, score at 4 3/4" AND 5 3/4" to create the spine. Using a bone folder, crease the score lines well. 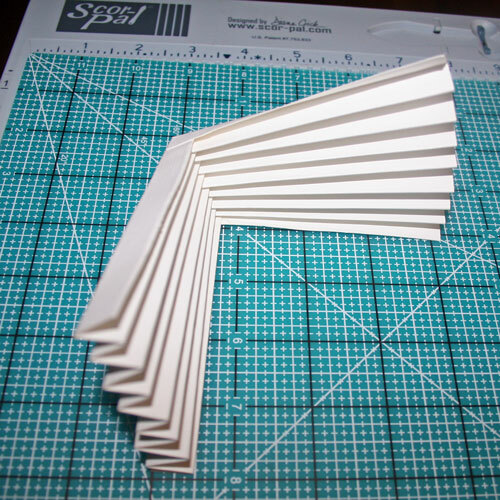 Cut 2 pieces of cardstock, each 4" x 8" and 2 pieces of cardstock, each 4 1/2" x 8". 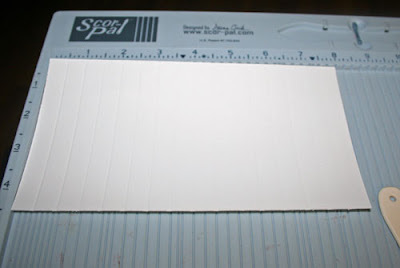 Using the Scor-Pal, score across each piece of cardstock at every 1/2", with the final score at the 7" mark. 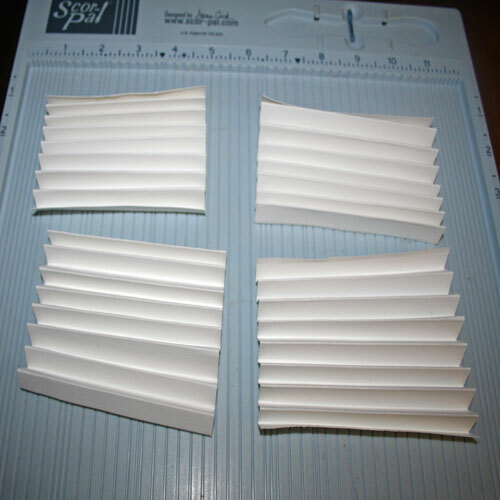 Using a bone folder, accordian fold each strip. To assemble, attach the longer pieces to the shorter pieces. Placing them flat, overlap the first flap and use Scor-Tape to adhere the ends. Carefully force each piece together and adhere at the final flap with Scor-Tape. Continue adding each piece and your book will look like this once completed. When adding the final piece, you need to assemble both sides at once. It's a little tricky, so take it slow and watch your box take shape. Ink all edges with Wheatgrass Ink. Using Scor-Tape, adhere ribbon around the outside of the book, being sure it is long enough to be tied into a bow once the book has been finished. 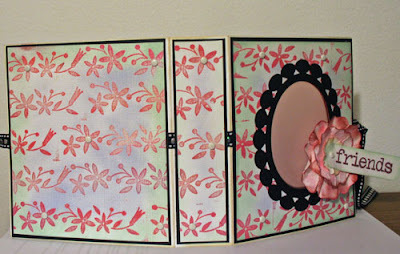 Using the Standard Flowers Rollagraph Wheel and Berry Ink, I created my own background papers. After embossing with Clear Embossing Powder, I randomly added several colors (Zen Garden, Wheatgrass and Stormy Seas) to the background using a Styllus. I used black cardstock to create the second layer as well as the interior layers of the book, cutting the cardstock slightly smaller than the front, back, and spine. 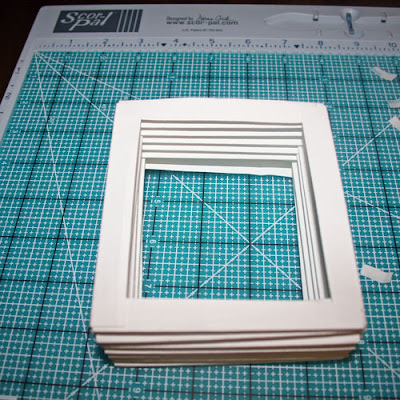 I cut apart the background paper I created, cutting it to fit the black cardstock mats. Before adhering these layers, I inked all edges with Wheatgrass Ink. Using Spellbinders Oval dies, I die cut the opening in the front of the book - you may need to use scissors to help the die cut process because you are cutting through 3 layers of cardstock plus ribbon. Using the Beaded Oval die, I die cut the top layer from black cardstock to finish off the front of the book which I then placed on top of a piece of vellum. I then randomly added white brads to all three sections to provide a little more stability. The flowers were cut using Spellbinders Blossom dies, inked with Berry Ink, spritzed with Gingerale Smooch Spritz and then crumpled. They became quite pliable and I could then make them any shape I wanted. Once the Smooch dried, I had the perfect flowers! I added some additional Berry Ink with a Styllus along the edges of the flowers. 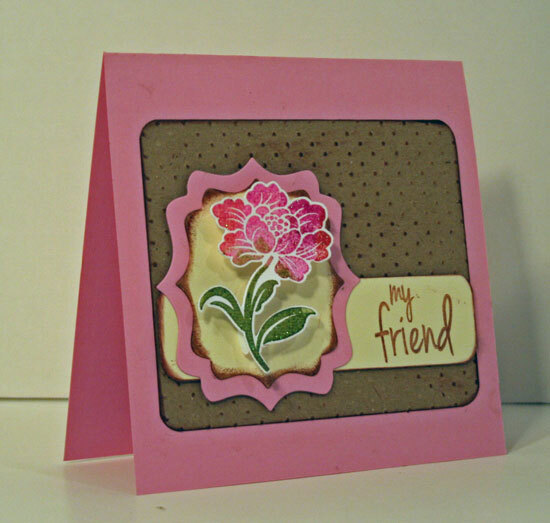 The sentiment was stamped with Berry Ink and embossed with Clear Embossing Powder, then attached through the center of the flowers with a brad. A glue dot holds the flowers to the book. Using the Simple Dots Rollagraph Wheel and Zen Garden Ink, I lightly rolled over the interior black mats, then inked along the oval cut out. I added a strip of the flowered background to the interior spine. Once the interior was finished and the accordian pleated box adhered to the base, I finished of the top edges with Spellbinders Fleur de Lis dies. Placing 2 coordinating dies together I die cut white cardstock to create a finished edge inside and out. A little Berry Ink was added to the dies before mounting to the accordian pleated box. 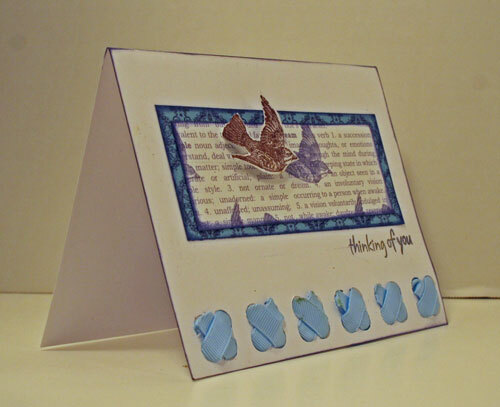 I used the cut off die cut piece for the interior sentiment which I stamped with Stormy Seas Ink and adhered to the bottom of my box. 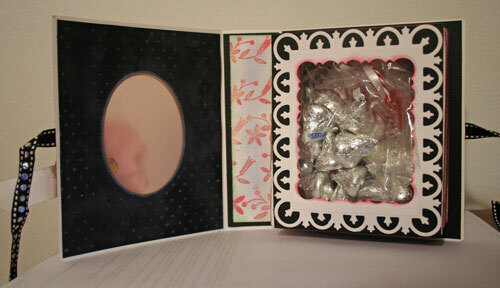 A small bag of candy kisses was the perfect finishing touch and looks nice tucked inside the book. Once the candy was pulled out, the sentiment is revealed. My first post for Globecraft Memories is posted on their blog and I wanted to show you what I've done with these fun new products. 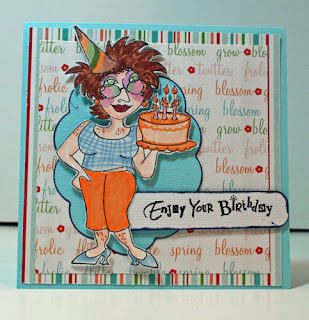 I am a card maker at heart so I couldn't wait to get my hands on these products. Taking apart the Love Flouishes Card Decor, I decided to start with the frame. I covered the frame with Enamel Powder Adhesive then added Enchanted Aubergine and heat set. I applied a second layer of Adhesive and another layer of Enchanted Aubergine. Once dry (and this product dries very quickly), I added random touches of Adhesive and then added 24K Gold Powder on top. As I heat set this final layer, the particles moved around creating some amazing effects on my frame. To add a little more pizzazz to the frame I used one of the flourishes from this set and covered it with Mermaid Tears. The sentiment was stamped with Stardust Watermark Twinkle and Mermaid Tears were added on top. After heat setting I had a beautiful sentiment. 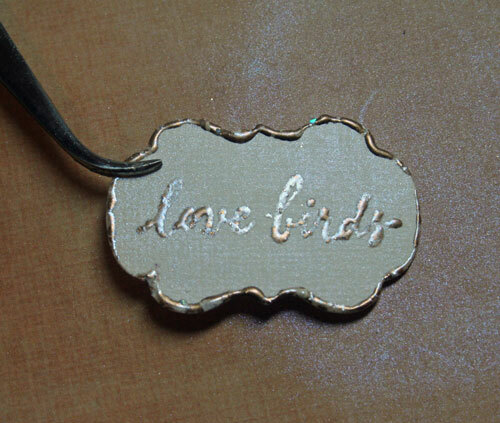 Using Glue Gloss around the edges of my tag, I again added Mermaid Tears by just pouring it over the tag. After heat setting I had this wonderful tag. I placed the frame on top of my stamped image and cut away the excess before creating my card. Then I added the sentiment to the right side with the tiny heart attached. One of my posts at ScrappinStuff last month. Love the Creative Imaginations papers. 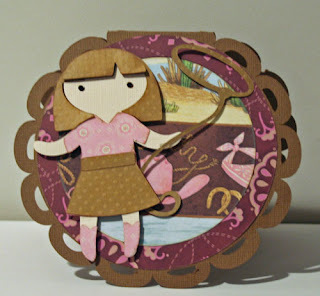 I used my Cricut and Wild Card to create the round card and Paper Dolls to create the girl. Wild Card Cartridge has a lot of great card shapes, but this has always been my favorite. When using double sided paper such as this Creatives Imaginations paper, you get 2 great effects in one cut. Just flip over the outer ring - no extra cutting involved. Die cut Rodeo Girl using Cricut Expression and Paper Dolls cartridge. Her boots and shirts were cut from Creative Imaginations paper and her hair, skirt and lasso from Bo Bunny Double Dots paper. She was added to the front with foam adhesives for dimension. Clearsnap's line of My First Colorbox Stamps and Inks are perfect for little hands to play with. 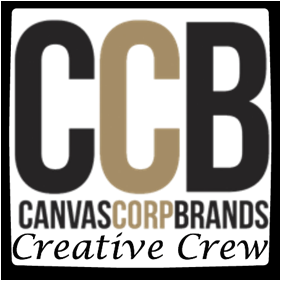 But they are also perfect for anyone who loves to create. The stamps are foam based and create great impressions. 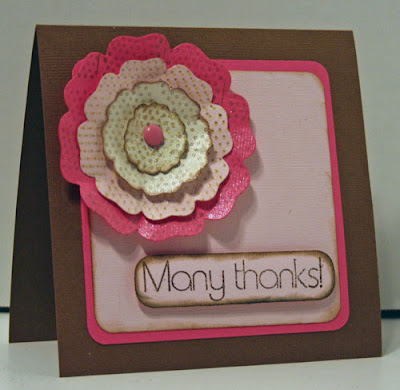 For my card, I used the Many Thanks Stamp set which includes 4 different dotted background stamps plus the sentiment. Using my Scor-Pal, I created a top fold card from brown cardstock, then added 2 layers of pink cardstock on top. To create the flowers, I stamped assorted dots with brown and yellow ink, then die cut the shapes. 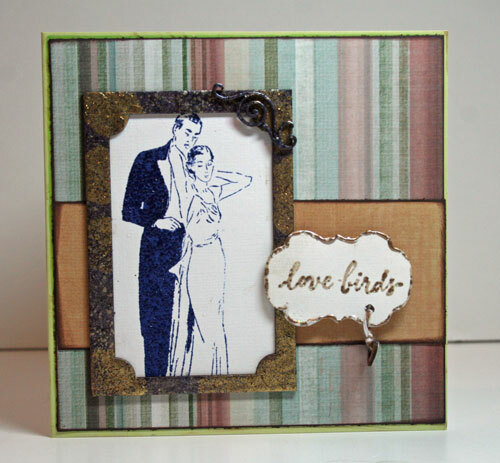 Once die cut, I spritzed each piece with Vanilla Smooch Spritz for a little sparkle then added them to the card with a brad. It's a little hard to see, but I added some Pink Fizz Smooch Glitz on top of the brad. The sentiment was stamped and embossed with Clear Embossing Powder, cut out and then inked before adding it to the card front with foam adhesives. Happy Mother's Day to everyone. 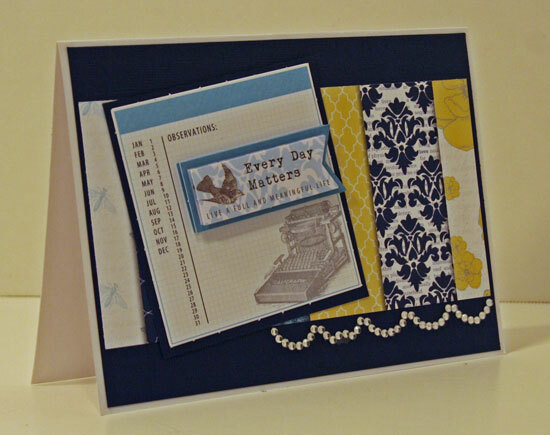 This card uses nothing but left over scraps and is not only fun, but easy to make. Using my left-over negative Clearsnap Designer Foils, I machine stitched them to a piece of brown cardstock which was cut slightly smaller than the card base. 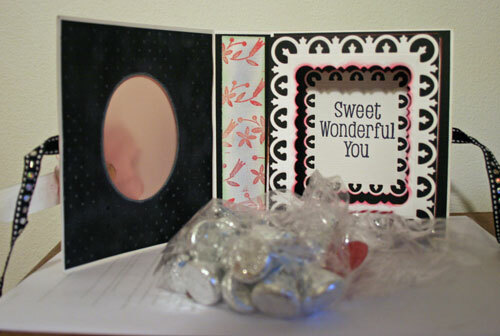 The large oval die cut was added on top and then machine stiched in place. Instead of ribbon, I wrapped some tulle around the card, then adhered it to the base. 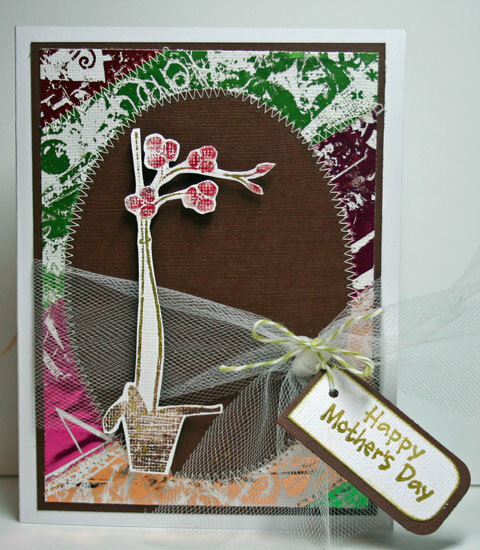 The image was stamped and embossed and then cut out and added to the card with foam adhesives. 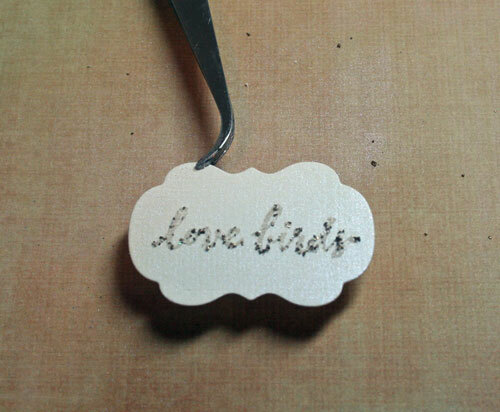 The sentiment was stamped and cut out and added to the card with some Twine. 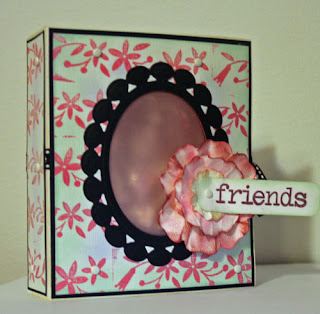 My newest post at Scrappin Stuff uses some awesome papers from the store. 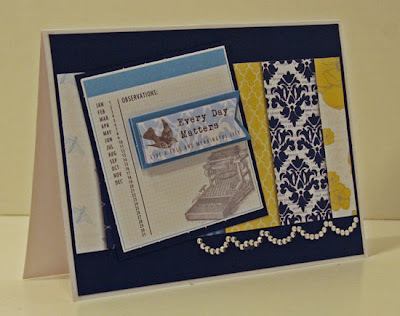 This is my latest post at thepapertemptress.com. 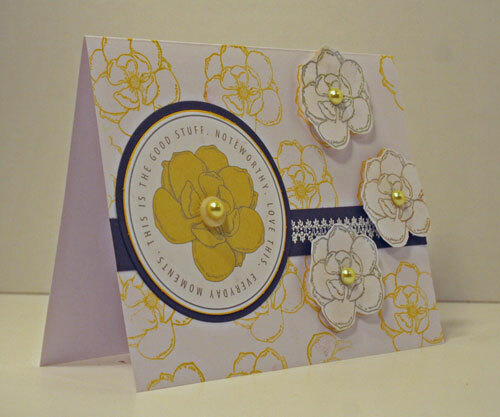 This cardstock is asolutely amazing - it's strong enough to create a card and also use as embellishments on the card. 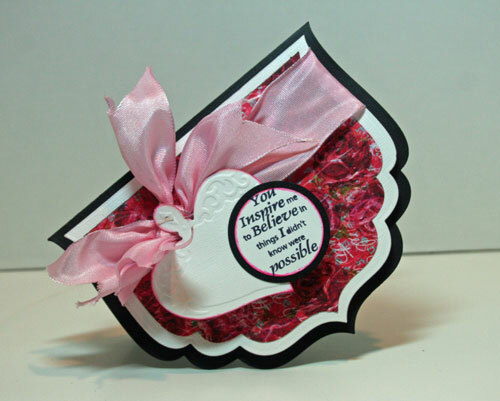 After creating the card from Pink Lemonade, I used Poison Ivory as one of my frame layers and for my sentiment. 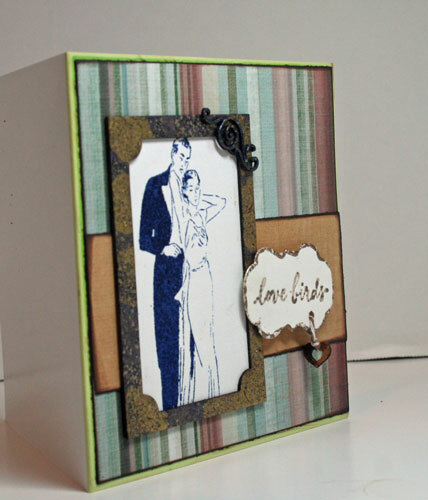 The Kraft paper was a perfect backdrop for the card. 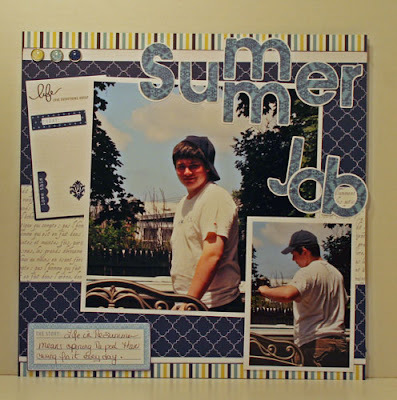 Today's post is up on the Scrapbookpal.com blog. The Art Nouveau Cartridge is a really fun cartridge full of lots of intricate images and corresponding layers. This is such a fun cartridge to work with. Selecting the Daffodil to work with, I decided to create a friendship card. All cuts were made based on a 6" Daffodil. 1. 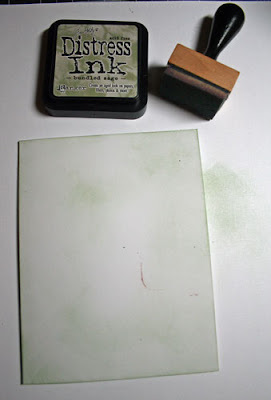 Begin by first inking the edges of a white card with Tim Holtz Distress Ink in Bundled Sage. 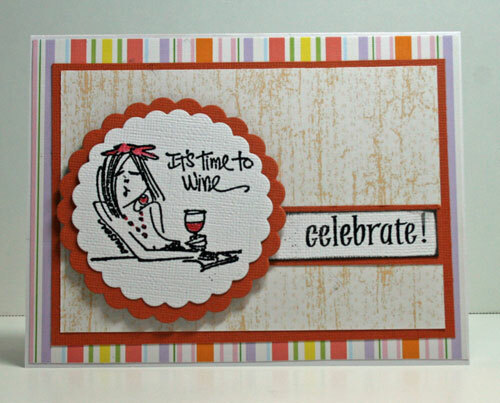 With an ink blending tool, ink the foam and then ink the card. Starting at the outside edges, gently work the ink towards the center of the card, adding more ink as needed until your white card is now a light green. 2. 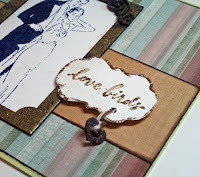 Nest, move to Tim Holtz Distress Ink in Crushed Olive. Working as noted above, just ink the outer edges with Crushed Olive to create a little contrast. 3. 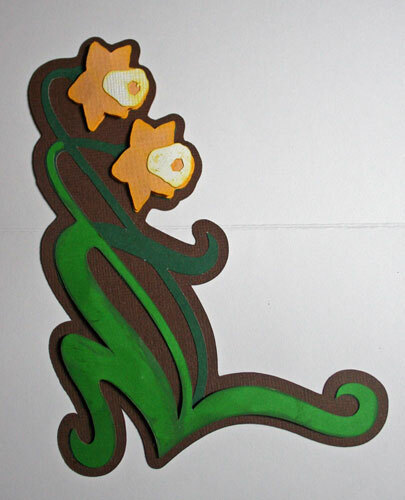 Starting with brown cardstock, cut the Daffodil shadow at 6". 4. 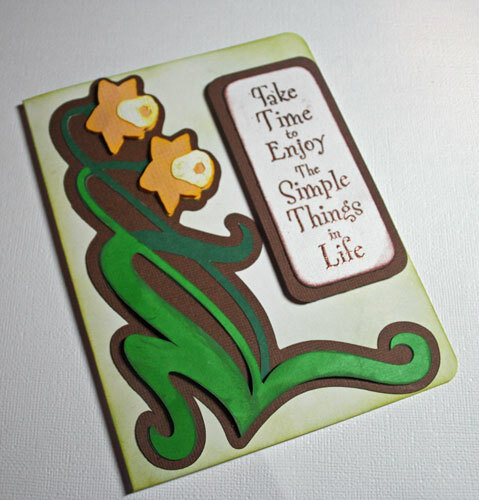 Next, cut the main daffodil from dark green cardstock at 6". 5. The next layer was cut from light green cardstock using shift+daffodil2. 6. 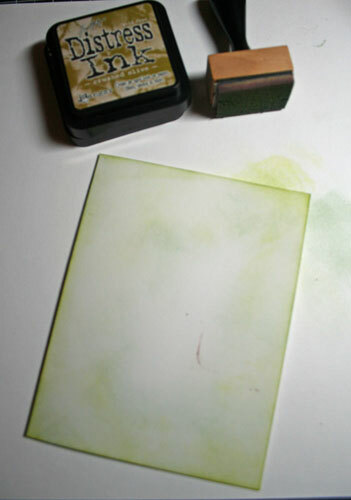 Lightly ink the light green stems with green ink, and gently fold the layer for dimension. 7. Adhere on top of the dark green stems with foam dimensionals. 8. 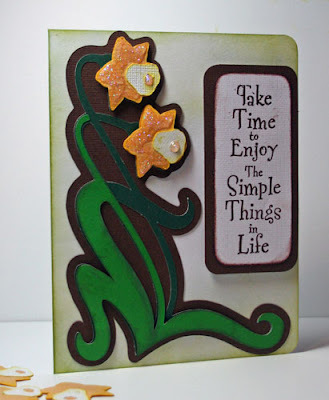 Cut the flowers from yellow cardstock twice using shift+layer1+daffodil2. 9. 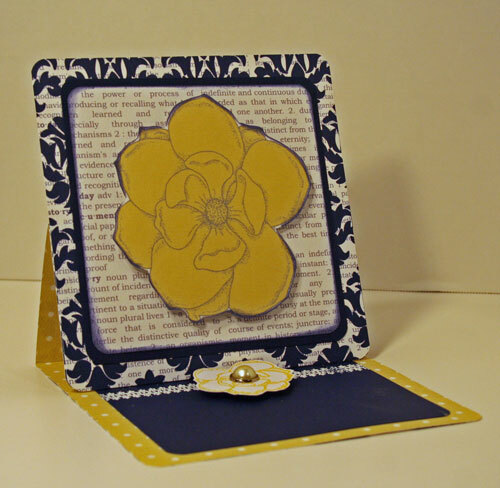 Gently fold two flowers and ink with yellow ink. 10. Ink the other two flowers and adhere them to the stems. 11. Adhere the first two flowers on top with dimensional adhesives. 12. Cut the flower centers from white cardstock using layer2+daffodil2. 13. Ink with yellow ink and adhere in place. 14. Stamp the sentiment in brown ink. 15. 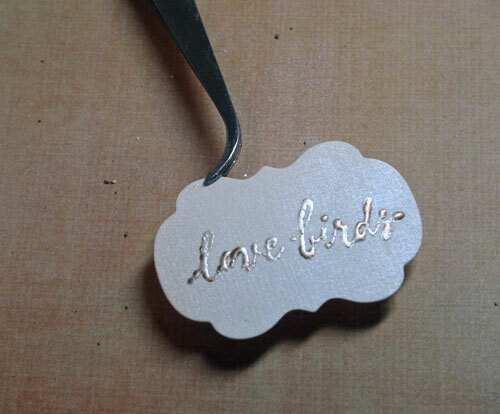 Add brown embossing powder and heat set. 16. Cut to fit the card front, corner rounding the edges. 17. 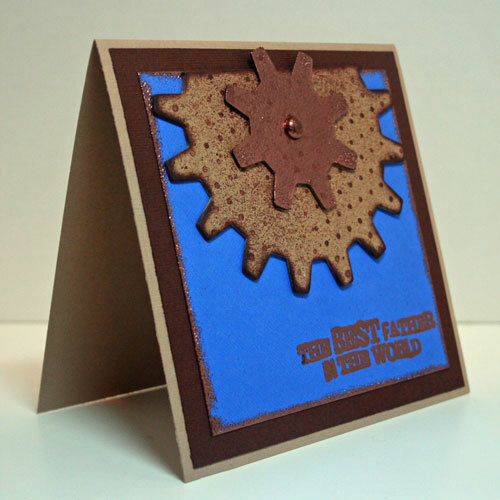 Mat with brown cardstock and adhere to the card front. 18. 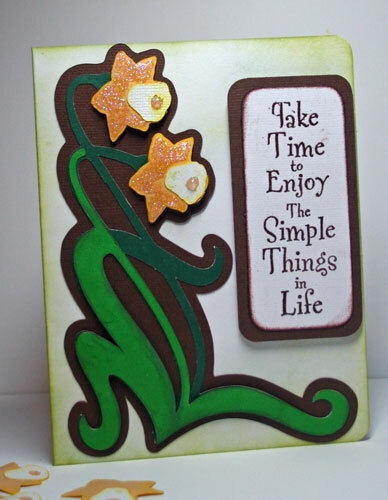 Once the card has been assembled, add Ranger Icicle Stickles to both yellow flowers. Allow to dry thoroughly before moving.